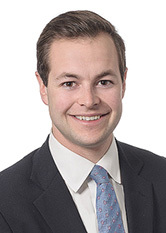 John H. Keneally is an Associate in the Litigation & Alternative Dispute Resolution Practice Group. His practice focuses on complex commercial litigation, including business and contractual disputes, employment claims, and insurance coverage litigation. While at Brooklyn Law School, he served on the Moot Court Honor Society and was the recipient of the Richardson Scholarship, Centennial Grant, Dean's Merit Scholarship, and Academic Achievement Scholarship.